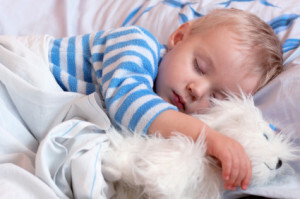 Some babies sleep through the night and others don’t. Why? This is a great question, and one that has many answers depending on who you ask. I can certainly tell you that generally once your child is 6 months of age, if someone tells you that your baby is waking for a night feed then this is incorrect. Certainly by 7 months no night feeding is necessary. By this age your baby has established a number of day milk feeds either breast or bottle and solids are well and truly established as well. This takes care of their nutritional needs. Night waking is then about nightime contact with mum. In fact parents who have been to my pre-baby workshop and learnt about sleeping cues, signs of tiredness, when your baby is hungry have a baby sleeping through the night by 12 weeks of age. By this I mean, sleeping from 6.30pm to 6.30am with only 1 feed at about 10pm at night or mostly not at all. This is quite normal and natural for all babies once parents know how to respond to their baby’s signs and know what a baby needs, and meet their needs. Hourly or two hourly feeding at this age is not normal neither is hourly or two hourly nightly waking, this is a sign that you baby is reliant on you as a parent to help them back to sleep rather than being able to wiggle, lightly wake and fall back asleep. Given that your baby is 11 months old and has no night feeds and self settles to go to sleep, then you are certainly on the right track to establishing an independent and wonderful sleeping situation for your baby. As you have said she simply wakes for a cuddle twice a night. So this is really about while she wakes and asks and you provide she will continue to ask. This is not about nightime emotional needs as some would advise. So in short this will continue as long as you provide. If you need to have a good nights sleep, as anyone would after 11 months of a broken sleep then do not go in to have the cuddle. This is not mean, or emotionally damaging in fact a recent study showed that the “it may cause harm….” argument to be a myth. I can tell you, I help coach parents on how to do this every single day in my work and in reality this will take about 3 or 4 days and then your baby will no longer wake. Once again not because you have ignored her needs and damaged her but because waking during the night no longer has the reward of nightime cuddles. The other fact to keep in mind is how tired you feel, your daughter feels exactly the same, even though she is doing the waking. The change in her will be enormous and obvious once the night waking has stopped. She too will thrive and benefit from a great night of uninterrupted sleep.